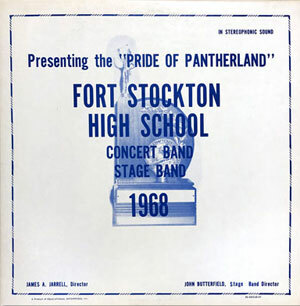 This is the last in a series of four posts spotlighting music from the Fort Stockton (Texas) "Pride of Pantherland" High School band. [Previously: 1966-1967 | 1967-1968 | 1968-1969] These posts will span the school years corresponding to the time yours truly (and MLB) spent in the band. I'm doing this as a way of preserving some of the musical memories that were made in those years. I'm sure that not everyone who was in the band at that time kept the record albums that were issued after each spring concert. If you were a band member during that era, please feel free to share your memories via the comments section below. A half century has passed, as have many of our schoolmates. This is a good time to record some history. Senior year (1969-1970) was a time of mixed emotions. We had a new band director -- Donald E. Hanna. Mr. Hanna was the polar opposite, style-wise, from Mr. Jarrell, but he was one of the finest directors and nicest guys I've ever known. He became well-known throughout the state for his directing skills. He unfortunately succumbed to cancer in 2014 at age 72. The war in Viet Nam continue to rage, and a few of my classmates were either drafted or enlisted after graduation. I had a fairly low draft number, but got a student deferment when I enrolled at Texas A&M. The draft never really was a worry for me, but it also wasn't taken lightly. But I digress. Band-wise, this was a great year. I was first chair clarinet for most of the year (Del Yarbrough -- later known as Dr. Yarbrough -- assumed it for a brief period, as I recall; for the record, I doubt that I was a better player than him, but I suspect that Mr. Hanna wanted a senior as first chair). I was Band Captain and MLB was Band Sweetheart. I'm positive she was more qualified for her position than I was for mine. Both of us made All District band (she was also a clarinetist). Here are photos of the band's 1970 album front sleeve -- in full color for the first time! -- and the record label. In addition, the back of the sleeve has a list of the band members, and I've included that below as well. The song I've selected from this album is in a different vein than the first two I picked. English Dances composed by Malcolm Arnold in the early 1950s. Arnold also produced the score for The Bridge On The River Kwai, for which he won an Academy Award. Unlike that song, English Dances had no whistling, which was a blessing. As you'll be able to discern from the very beginning of the piece, English Dances was a bear of a song for woodwinds, and I think we acquitted ourselves admirably with it. 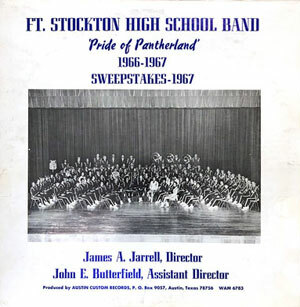 This is the third in a series of four posts spotlighting music from the Fort Stockton (Texas) "Pride of Pantherland" High School band. [Jump to: 1966-1967 | 1967-1968 | 1969-1970] These posts will span the school years from 1966-67 through 1969-70, corresponding to the time yours truly (and MLB) spent in the band. I'm doing this as a way of preserving some of the musical memories that were made in those years. I'm sure that not everyone who was in the band at that time kept the record albums that were issued after each spring concert. 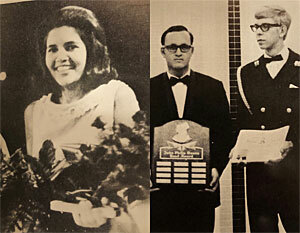 I came into my own during my junior year (1968-1969). I challenged for first chair clarinet (no more playing the second parts for me!) and again made the All-District band. This was to be Mr. Jarrell's last year in Fort Stockton. It also wasn't the best year for the band overall, as we failed to win Sweepstakes. The first moon landing occurred in July, 1969, and I remember it because I and two bandmates -- Tommy Schlegel and John David Evans (RIP) -- drove my parents' 1958 Ford (without a/c) to Norman, Oklahoma to visit Mr. Jarrell. We watched the landing on his TV. [Ed. They landed on the moon, not on his TV.] On the return trip we made it as far as Penwell, between Monahans and Odessa, before the alternator gave out and we had to call our dads to rescue us. Good times. Here are photos of the band's 1969 album front sleeve and the record label. The song I've selected from this album is in a different vein than the first two I picked. España Cañi (translated as "Gypsy Spain") is a Spanish paso doble, or two-step (not to be confused with the country dance of the same name). It was composed by Pascual Marquina Narro (also styled as Pascual Marquina) in the early 1920s. It is sometimes referred to as the Spanish Gypsy Dance, and it's still frequently played in Latin paso doble dance competitions. 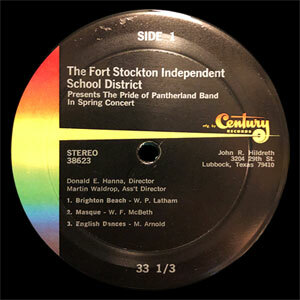 This is the second in a series of four posts spotlighting music from the Fort Stockton (Texas) "Pride of Pantherland" High School band. [Jump to: 1966-1967 | 1968-1969 | 1969-1970] These posts will span the school years from 1966-67 through 1969-70, corresponding to the time yours truly (and MLB) spent in the band. I'm doing this as a way of preserving some of the musical memories that were made in those years. I'm sure that not everyone who was in the band at that time kept the record albums that were issued after each spring concert. One could make the case that 1967 was the greatest year in music history. Groups like Cream, the Rolling Stones, the Jimi Hendrix Experience, the Doors, and Jefferson Airplane populated the charts, and the Beatles released Sgt. Pepper's Lonely Hearts Club Band. 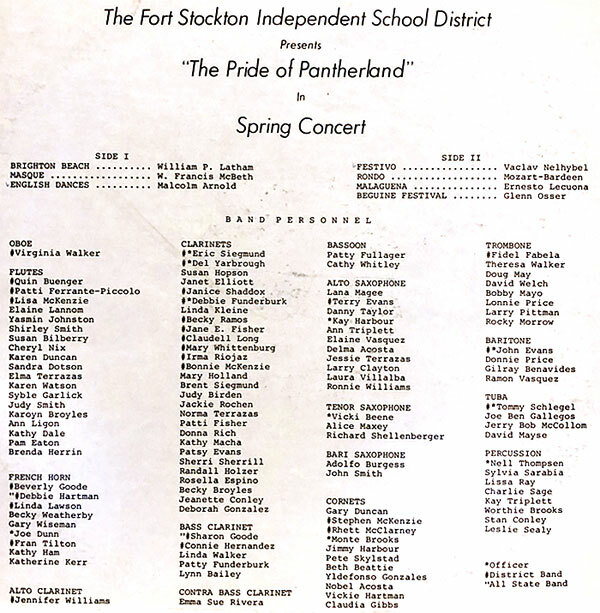 All good stuff, but in Fort Stockton, the Pride of Pantherland was continuing its hot streak. Band in my sophomore year (1967-1968) was more comfortable. Mr. Jarrell, our director, was a stern but capable leader, and I was much less intimidated by him. I also improved my skills during the year, and made the All-District band for the first time. I don't have much natural musical talent but what I had back then was the ability to actually enjoy practicing. And it's a good thing I was improving in band because I was a lousy athlete. 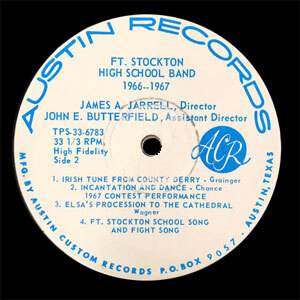 Here are photos of the band's 1968 album front sleeve and the record label. The song I've selected from this album is Chester, composed by William Schuman who, according to this article, won the first Pulitzer Prize for music composition, and also received a Kennedy Center honor in 1987. The piece was written in the mid-50s and the tune is based on a 1778 anthem purported to be sung around campfires and adopted as a marching song by the Continental Army during the American Revolution. Schuman died in 1992 at age 81. As before, here's the digitized version of the original vinyl recording. The first two minutes are pretty sedate, but the notes come in vast bunches shortly thereafter. We must have impressed the judges; for the second consecutive year, the band won Sweepstakes. 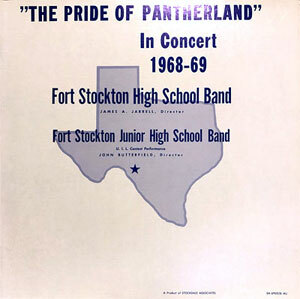 This is the first in a series of four posts spotlighting music from the Fort Stockton (Texas) "Pride of Pantherland" High School band. These posts will span the school years from 1966-67 through 1969-70, corresponding to the time yours truly (and MLB) spent in the band. I'm doing this as a way of preserving some of the musical memories that were made in those years. I'm sure that not everyone who was in the band at that time kept the record albums that were issued after each spring concert. I was a freshman clarinetist entering high school in 1966, and being in the band was simultaneously exciting and terrifying. I don't have many specific memories of that year, but I do recall being rather intimidated by the director, James A. "Buddy" Jarrell. 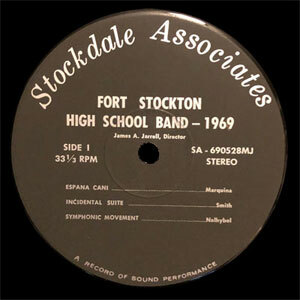 What I do remember is that Fort Stockton had a pretty good band, and we proved it by winning "Sweepstakes" that year. Sweepstakes was awarded to high school bands that received a "1" ("superior") from the judges in three separate contests: marching, sight-reading -- playing never-seen-before music -- and prepared concert. I was a pretty good clarinet player in junior high, but high school was a whole other ballgame. Still, even as a freshman, I managed to work my way up to the middle of the section, playing the second part. The best part of the year was when my future wife walked into the band hall. Little did I suspect that in seven years, we'd be married, and I'm sure she would have been aghast at the proposition at that point. Here are photos of the band's album front sleeve and the record label. 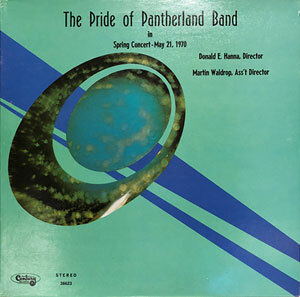 The song I've selected from this album is Incantation and Dance, composed by John Barnes Chance and premiered in 1960. Chance composed a number of pieces popular with high school bands, including Variations On a Korean Folksong which our band actually performed the next year. Chance died from accidental electrocution in 1972, at age 39. There I am...third row on the right, third from the end. You see me, right? Here's the song, ripped directly from the original vinyl, in all its crackling glory. It starts slowly, but morphs into a pretty challenging piece. Alert Gazette readers will recall the Gazette's staff's unnatural fixation on vinyl albums featuring the music of Glenn Miller, and album notes related thereto. For those who were hoping this was a passing fancy, we regret to inform you that there's (at least) one more episode. I have previously mentioned that I'm digitizing LPs from my parents' collection, but I've also got a few albums that were previously in the possession of my father-in-law. 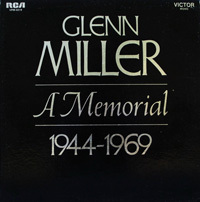 One of those, a two-platter set, is entitled Glenn Miller -- A Memorial -- 1944-1969. If you're wondering, as I did, about the seemingly odd span of years in the album title, the only explanation I found is that it corresponds to the 25-year period between Miller's disappearance over the English Channel and the year of this album's release. It's a non-intuitive reference, to be sure. This particular collection contains thirty of Miller's performances, most of which are duplicates of other albums I've already digitized. But there are some new cuts, such as Perfidia, Elmer's Tune, and At Last, a song that I had always attributed to Etta James but which was actually first recorded by Miller's orchestra. 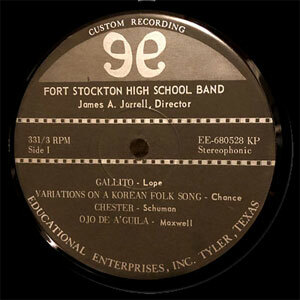 The tracks on this collection are listed in the order of the recording dates for each song, beginning in April, 1939 and ending in July, 1942, the year Miller enlisted in the Army. He recorded additional music with the Army Air Force (AAF) band he led, but no additional recordings with his original orchestra were made. The album notes included in this collection are significant due primarily to their author: Benny Goodman. Mr. Goodman elected to not comment on the individual performances included in the collection, but rather focused on his personal relationship with and observations about his fellow musician and close friend. Following are those liner notes in their entirety. The majority of you who buy this record are probably dyed-in-the-wool fans of Glenn Miller and His Orchestra, and perhaps this music will revive the memories of dancing to Glenn in person. I too have been a Glenn Miller admirer, and for over a longer time than any of you, for we were friends for many years. During the late '20s we worked together in Ben Pollack's Band, for which he arranged and played trombone and in which I played sax and clarinet. When the band broke up in the early '30s, Glenn and I lived together and hoped we would find enough work to support us. At first it wasn't easy. Those were deep depression days and there wasn't enough work to go around for all the musicians. We lived at the Whitby Apartments on West 45th Street and things got so rough for us that occasionally we would get up early and borrow empty mile bottles from in front of other apartments and cash them in at the local grocery store so we could buy hot dogs for lunch. Glenn in those days was exactly the same as he was about eight years later when he became leader of the most popular band in this country. He was an honest, straightforward man and you knew just where you stood with him. He was always serious about his work, but off the job he was an excellent companion with a wonderful sense of humor and a great feeling for the ridiculous. Have you ever heard the nonsensical lyrics he wrote for the Dorsey Brothers record of Annie's Cousin Fanny? You had to have a pretty real sense of humor to come up with ideas like those. We who knew him well in those days found him to be an excellent friend - generous and concerned, sometimes serious, but never stuffy, and all the musicians in our circle admired him tremendously. He was a dedicated musician and an excellent arranger, full of original ideas such as the lyrics he contributed to the Charleston Chasers recording of Basin Street Blues, the one on which Jack Teagarden sang. We both played in the pit of two Gershwin shows: Strike Up The Band and Girl Crazy. I think his greatest contributions were made to organized dance orchestras. He wrote many fine arrangements for us in the Pollack Band, so when the Dorsey Brothers decided to form their own band, they asked Glenn to arrange for them. He not only created some exciting charts but also played a major part in the formation of their band. And so it wasn't surprising that when Ray Noble came to this country he selected Glenn as organizer and arranger for his American band. Here again Glenn turned in a first-rate job. Those of us who had been close to Glenn weren't entirely surprised when he decided to form his own band. After all, he had proven himself to be a careful and thorough organizer and rehearser, and, even though he had never officially been credited as such, at least some sort of co-leader of the various bands in which he had played. As all Miller fans know, it wasn't easy for Glenn at first. I remember that in either late 1937 or early 1938, when we were playing in Dallas, I ran into Glenn, whose band was working one of its first steady jobs at the Adolphus Hotel, and he was very downcast and discouraged and kept asking me just what it was he needed to become successful. I really couldn't tell him anything he didn't already know, but I remember I did try to encourage him all I could. Nothing I said, I suspect, had anything to do with it, but within a year Glenn's band had suddenly hit. If after that anybody was going to anybody else for advice, it might have been smart of me to turn to Glenn for his! Many people try to analyze just what it was that made Glenn's music so successful. I can think of several reasons. He had a great sense of the commercial, of what would attract the average listener, and this he managed to do without sacrificing his musical integrity. This is one reason why his band was so loved by so much of the public while still retaining the respect of so many musicians. Glenn was also able to find the particular sound he was looking for that gave his orchestra the personal and distinctive sound which was recognized as his signature. Glenn had an amazing ability to recognize talent, even when it was in the raw, and to help develop it. Think of the many young musicians who broke in with his band - men like Tex Beneke and Hal McIntyre and Trigger Alpert and Willie Schwartz, and especially the arrangers like Bill Finegan, Jerry Gray and Billy May who had done all right with other bands, but really blossomed under Glenn. And, finally, I should point out that Glenn had a great knack for handling people. He may have seemed aloof to some of his public - and that aloofness was natural, for Glenn was not an outgoing person, at least not until he got to know somebody well - but he still managed to impart a sort of mature warmth to his public. However, it was in dealing with musicians that he really shone. He was a "driver," as many of us leaders of those days were labeled, but he drove his men gently and with reason, and he invariably respected them and treated them as human beings, just as he himself always expected to be treated by others. The music contained in this album certainly reflects the spirit of Glenn Miller, the Musician. I hope these notes will have added to your knowledge of Glenn Miller, the Man. I shall ways remember him and be grateful to have had him as a good friend.